If the term “smart sound bar” seems unusual, that’s because it’s brand new. TCL just announced the first in a new class of gadgets that act a little bit like a smart speaker and a little bit like a remote control that’s powered by your voice. As the name implies, the new TCL Roku Smart Sound Bar is powered by the newly announced Roku Entertainment Assistant. Suddenly, everybody’s favorite set-top box company does a lot more than make set-top boxes. 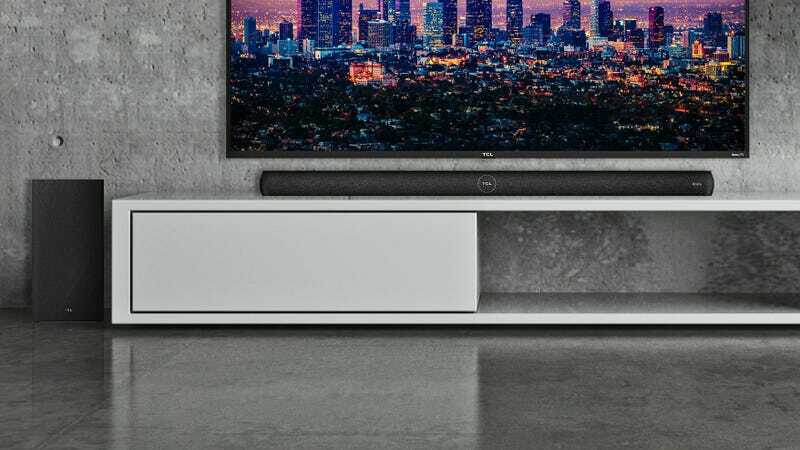 This all might sound a little bit confusing, so let’s dive right into what TCL’s new smart sound bar actually does. The Roku Entertainment Assistant is a voice-controlled assistant that’s a lot like Alexa, but its functionality is focused on controlling devices like TVs, speakers, and, of course, sound bars. This means that you can tell the TCL Roku Smart Sound Bar to turn on the TV and on the TV will turn, regardless of what kind of TV you have. You can also use the Roku Entertainment Assistant to search for content and play music on the sound bar, even if the TV is turned off. If you happened to have a TV powered by Roku OS, the Smart Sound Bar will give you even more control over your devices. Roku announced its new Entertainment Assistant alongside a new licensing program called Roku Connect. This feature sounds a bit like Airplay, because devices enabled with Roku Connect or powered by Roku OS can easily talk to each other over the air. For now, the TCL Roku Smart Sound Bar is the only device with Roku Connect, but you could easily see how other speakers and TVs will adopt the new standard. Aside from the Roku Entertainment Features, TCL hasn’t offered much more information about the new Smart Sound Bar. The device will ship in late 2018 as the first member of the new Alto family of TCL products. Additionally, TCL is launching two all-new lines of 4K TVs powered by Roku OS: the 6-Series and the 5-Series. Both series include top notch specs like Dolby Vision HDR and Wide Color Gamut, while the 6-Series sets itself apart by offer up to 120 Contrast Control Zones. The new TVs will be available this spring. Pricing has not yet been announced on any of the new TCL products.